Calling all Mouseketeers!!! Here is the perfect Mickey mouse waffle maker for you and your kids - the perfect mousekatool! This authentic Disney Mickey Mouse waffle maker is exactly what any true waffle loving Mickey fan needs (other than a visit to the Mickey Mouse Cl﻿﻿ub House!) and I am here to tell you all about how it works. You can already see that the waffle will be super cute but will it taste good? Does the Mickey Mouse Waffle Maker really make a perfect Mickey shape? Well, let's find out! Watch our video review here or keep reading to find out more about the Mickey Mouse Waffle Maker. When you first take the Mickey Mouse waffle maker out of the box, you are greeted with a bright red waffle maker with a friendly black and white Mickey who truly looks like he is ready to make some waffles. The non-stick waffle plates are ready to go, no greasing or seasoning required. Simply plug in the Mickey Mouse waffle maker and you are on your way to making the most adorable waffle ever. 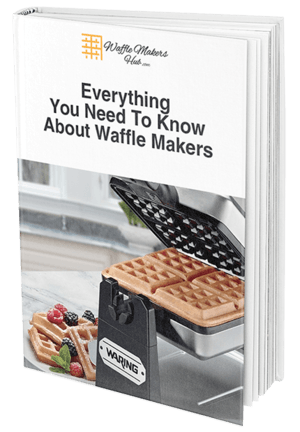 The instructions included with the waffle maker suggest 3-6 minutes to heat the waffle maker up and 3-5 minutes to cook the waffles. A few short minutes and you'll be on your way! About 3/4 of a cup of our perfect waffle batter filled the Mickey Mouse shape inside this waffle maker. I kept the waffle maker closed for about 4 minutes then opened it up to reveal a beautiful Mickey Mouse waffle! I have to admit, I was excited at how nicely it looked and no batter stuck to the waffle iron at all making it easy to remove the waffle from the iron. I flipped the waffle over on the plate as the bottom of the Mickey looked even better- perfectly golden browned. The waffle was slightly crispy but a little softer than a typical Belgian waffle. (If you just want a traditional Belgian waffle, give the Oster DuraCeramic waffle maker a try!). The four minute cooking time seemed accurate as the waffle was cooked through and was ready to be eaten by my hovering 2 year old! There is no indicator light to tell you when the waffles are done so you need to use a timer or watch the clock closely- you don't want to burn Mickey! So Should I Buy This Waffle Machine? Yes! If you love Mickey Mouse or have a Mickey Mouse fan in your house, you should definitely buy this Mickey Mouse waffle make﻿﻿﻿﻿r (if this doesn't sound like the right waffle maker for you, check out our blog about thin﻿﻿gs to consider﻿﻿ when buying a waffle maker- we will help you find what you are looking for!). Not only does it make a perfectly shaped Mickey Mouse but it also makes a decent tasting waffle. If you have a kid who is a picky eater then definitely don't wait, click here and get this Mickey waffle maker now! My 2 year old gobbled the whole waffle down without any syrup and asked for seconds. I admit that I was skeptical about how well a character shaped waffle maker would work in my kitchen. Some I have tried in the past burn the waffles, undercook the waffles, or make unrecognizable shapes. However, I was so pleasantly surprised by this machine that I have been using it every day and not just for my daughter's breakfast but for mine as well! So great job Disney on making a quality character waffle maker! Mickey waffles are here to stay in our house!